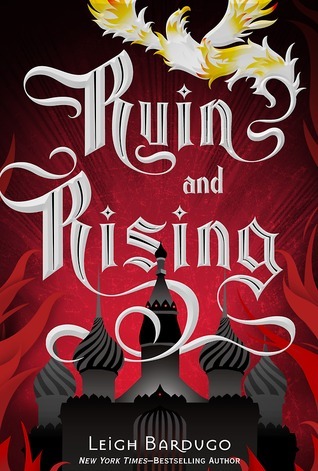 Ruin and Rising is the final book in the Grisha Trilogy. The Darkling has taken control and Alina must find the third amplifier if she has any chance of defeating him, but the cost of power may be too much for her. This book has the same gorgeous, flowing writing as any Leigh Bardugo book. Her prose is elegant, but what I really love about it is all of the touches of humor to lighten can definitely be a dark read. The world building in this book is equally excellent, with the world that was first introduced in Shadow and Bone having been expanded on. You can clearly see the effort Leigh Bardugo took in developing this world and the politics that exist in it. Ruin and Rising revolves a lot around politics, planning, and traveling. That said, the tension is always high, making even slower moments impossible to put down. This book also has plenty of plot twists that completely took me by surprise (which isn’t common for me). The one downside to this book is the ending. You will either love it or hate it. During my first read, I was on the hate it side, but after rereading it, I’m starting to learn to like it and appreciate the direction Leigh took it. While it wasn’t exactly what I wanted (and the final battle definitely felt a little rushed), it was certainly memorable. These characters. I love them all so much. Listen, after my first read, I wasn’t a Mal fan. But now? His development is amazing, and he definitely is one of the most loyal characters I’ve ever seen. However, I will say I still love Nikolai more than him. Nikolai is such a fun character, and I spent this whole book just wanting him to be happy. I’m so glad I reread this before King of Scars because I forgot how much depth there was to Nikolai– his ambition, his intelligence, and his dedication make him so amazing. Meanwhile, the path that Alina takes in this book is fascinating. She walks the line between hero and villain, showing just how easy it is to become the very thing you hate. Her struggle with ambition, greed, and power is amazing to watch. And speaking of power- The Darkling. I love him so much, and yes I know he’s a monster. I just love him as a villain, and as the antagonist in this book. He’s by far my favorite villain, and one of my favorite fictional characters. This book delves further into his backstory and shows how he became what he is, and it is fascinating. I also just want to mention that the side characters in this book are also amazing and I love them all. Genya and David are relationship goals, Harshaw and Oncat make my life complete, there’s some LGBT rep that makes me smile whenever I think of it, and Zoya slowly became one of my favorite characters in this series. Cons- The ending hurts. A lot.